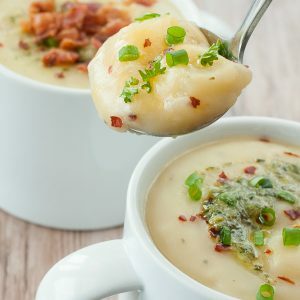 No cream is needed for this lusciously creamy Pesto Potato Soup. Light and gluten-free, you're free to splurge a little on your choice of toppings! Peel and dice potatoes into even cubes. Set aside. Dice your onion, then add to a large pot [or dutch oven] heated to medium-high heat with 1 TBSP butter. Sauté until tender, adding garlic towards the end. Next add your potatoes and broth and bring to a boil on high. Reduce to heat slightly and allow the soup to vigorously simmer. Cover, leaving the lid slightly ajar and cook for 10-15 minutes, until potatoes are fork tender. Using an immersion blender, blend soup to desired consistency. Partially blend for a chunky soup or blend fully for a smooth, silky potato soup. Reduce heat to low and simmer for an additional 15-20 minutes. Add milk, parmesan cheese, and pesto. Stir then season with salt and pepper to taste. Swirl with additional pesto as needed. Pile high with toppings or dig in as is - it's great every which way! Recipe yields 8 cups of soup or 4 larger bowls. No immersion blender? No problem! You can set the soup aside to cool when you're ready to puree it and blend in batches using your food processor in blenders. Always under-fill your appliance and use cooler soup to avoid soup expansion explosions. Nutrition Facts are an estimate gathered using an online recipe nutrition calculator. Calculated before toppings; adjust as needed.